You are here: Home › Customer Applications › Drying Technology › Complete ROI in only 14 months! Complete ROI in only 14 months! Schmit Prototypes, of Menomonie, WI provides manufacturing services in prototype & production volumes. With customers across the nation Schmit Prototypes is well known for providing quality work and customer service in the following areas: design, 3D printing, urethane & silicone cast molding, CNC milling & turning, aluminum & steel inj. tooling, injection molding, and various finishing services including painting. 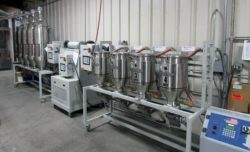 Three years ago Schmit Prototypes installed the Dri-Air Industries hopper bank drying system, which has simplified and improved their processing. “Being a custom molder we tend to do a lot of mold/material changeovers, having resin readily dry and available is crucial to our success in meeting our customers’ demands,” said Steve Upton, President. Labor savings with both set up and change over. The company did a cost study on the savings the Dri-Air Hopper Bank System has provided, and determined that they made a complete return on investment within 14 months of installing the system.